Following his scintillating Bad album and mammoth world tour, pop superstar Michael Jackson was a prime target for video gaming (something he was known to dabble in himself) at the dawn of the 16-bit era. 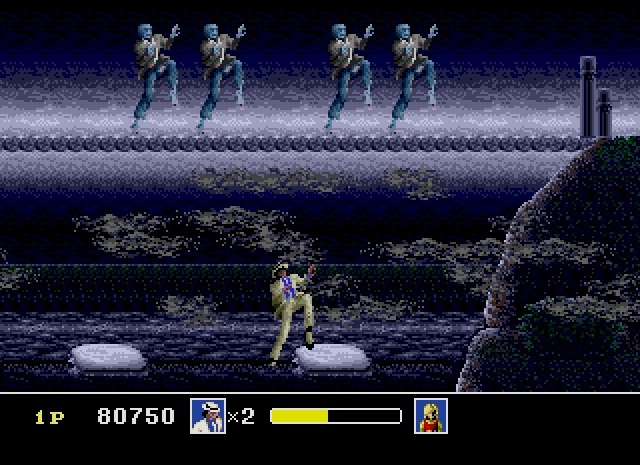 It was SEGA who would seize the opportunity to make a home console game based on his ’89 movie Moonwalker. By turns marvellous and a little clunky, this scrolling beat ‘em up is a solid tie-in, and with a style and swagger that’s almost undiminished with age, it’s become a cult favourite amongst fans. 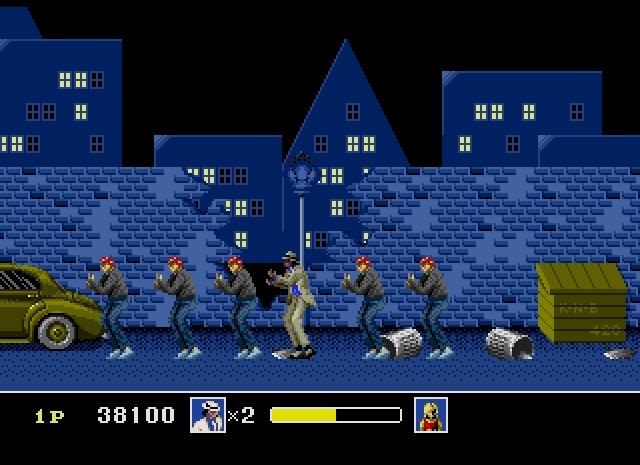 Part based on the film, part homage to MJ’s music videos, Moonwalker masquerades as a scrolling beat ‘em up, though carries a focus on platforming, ranged combat, measured pacing and open level structures that are more typically associated with run ‘n’ guns like Rolling Thunder. Each of the game’s five themed stages comprises of three levels, the aim of which being to save a designated number of hidden/lost children (all of whom resemble Katie from the film) from the surrounds and then besting an end-of-level flurry of foes in order to progress. The levels are at their best when matching the look and feel of their music videos. ‘Club 30s’, set in a seedy bar lifted straight from the Smooth Criminal short film, is an undoubted highlight. SEGA realised a host of neat, fan-pleasing details; Jackson opens the game by flicking a coin into a jukebox, signalling light, music and the action itself to begin rolling. Elsewhere, there’s sprites in mob attire, pianos to dance atop, even beefy henchmen who use pool cues as weapons. It’s a great introduction, showing off Moonwalker’s mostly-solid navigation and offering ample opportunities to try out Mike’s moves. "Got this baby for $100. Ow!" It’s followed by the almost equally impressive Beat It-inspired streets and parking lots, with Mafiosos replaced by eastside street gangs. After that, things are a little hit and miss. Graveyard levels bear passing resemblance to Thriller, complete with eerie mist and zombies rising from the ground, though perhaps due to licencing issues, the comparison is hampered through the stage’s decent though entirely incongruous musical accompaniment of Another Part of Me. Billie Jean plays along to a spider-filled cavern, which sadly doesn’t feature any dancefloor tiles that light up when you stand on ‘em. Boo. Along with Bad playing alongside the enemy lair at the end, it’s a wee bit harder to enthuse with the game when it goes off into more generic fare; play remains relatively consistent, but with fewer references and less general sparkle. The levels look a touch sparse (aside from the excellent aforementioned streets), whilst the in-game HUD is similarly rather bare. This is in marked contrast to the MJ sprite however, which is absolutely mega. SEGA really went to town on a character that looks the part, moves beautifully and has a dazzling repertoire of moves at his disposal. 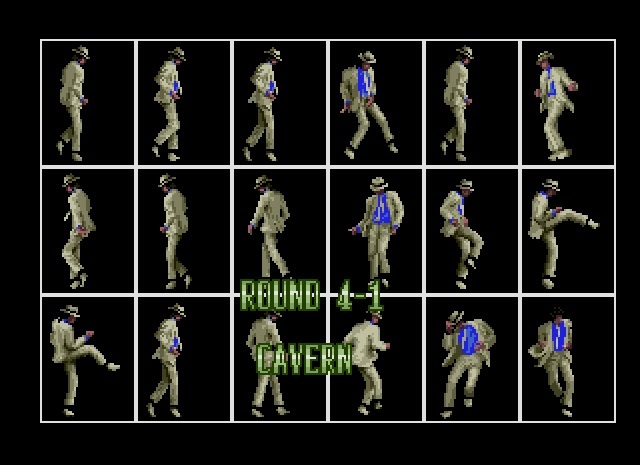 Donning his famed white suit and fedora, Jacko exhibits a range of kicks, flicks, spins and stances that superbly mimic his real-life signature moves, and the sheer, unwavering fluidity of his actions make for what is perhaps one of the finest sprites of the 16-bit era. Special moves prove the icing on the cake. When instigated at the cost of health, all enemies remaining on the screen are compelled to perform a trademark dance routine (differs depending on the stage and song) in tandem with Michael, and it’s just brilliant. Then there’s the considerable lure of the music. If you’re a fan of the King of Pop’s output, then this is an easy sell as the five levels are matched with five excellent songs. 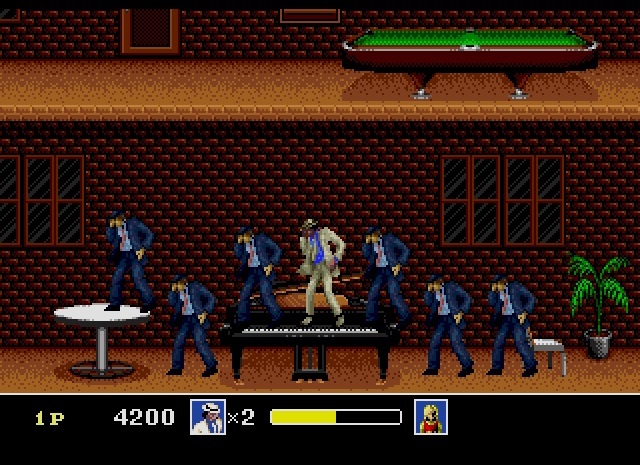 Objectively, SEGA have transitioned sound into the game relatively well; Smooth Criminal and Beat It lose a little something in the flat, less punchy output of Mega Drive audio, but Billie Jean and particularly Bad are re-worked superbly in their 16-bit iterations. Likewise, speech is mostly very good. Cries of ‘oh!’ and ‘ow!’ in-game are neat if a touch grainy, whilst the occasional ‘Who’s Bad?’ sounds crisp and is used effectively. "Best blend in and hope they don't spot the outfit..."
Truth be told, it doesn’t rival the stronger brawlers on the system gameplay-wise, nor does it offer as absorbing or lengthy a campaign as Rolling Thunder 2, but it’s fun enough. Controlling Michael is relatively trouble-free, except the odd occasion when trying to get him to take stairs, whilst special moves prove an enduring novelty and the tunes keep things ticking over. Some of the end of level encounters can feel a bit cheap, especially in the graveyard levels, and though the developer aimed for a degree of variance in the look and layout of the levels, the hide ‘n’ seek mantra behind solving each level ultimately isn’t all that exciting. The lack of a two-player option is a minor disappointment too, and though there’s a trio of difficulty settings to tackle, it is a fairly short game. 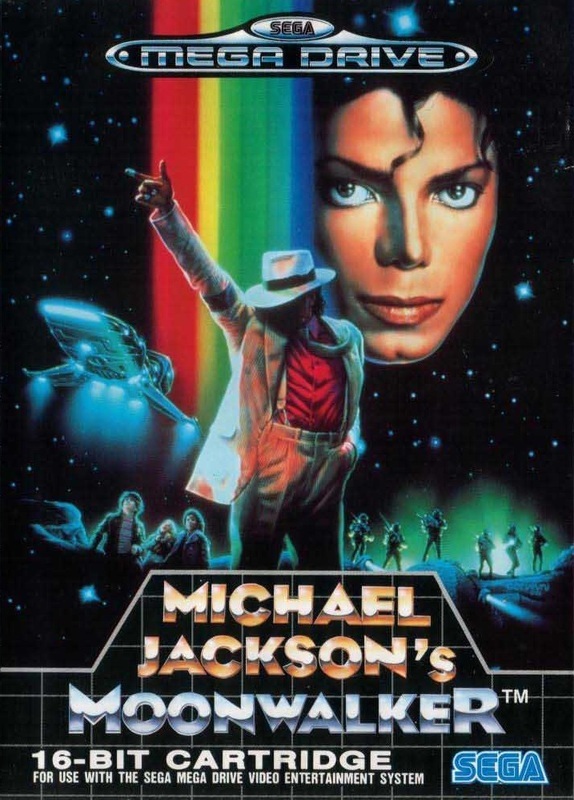 Nevertheless, Moonwalker is a reminder that when channelled correctly, a star’s attachment to a project can sometimes serve to elevate it rather than cheapen it. 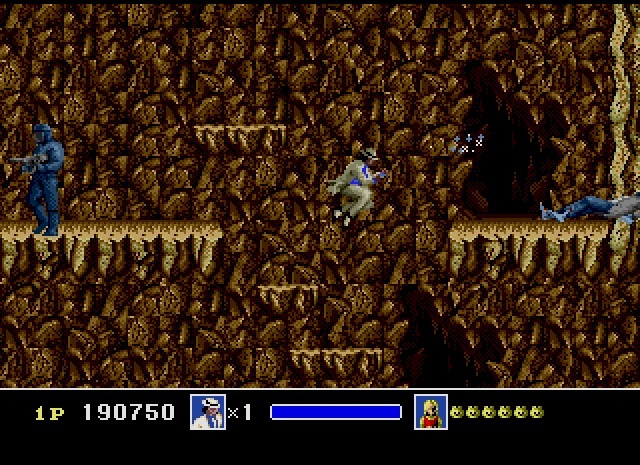 Michael Jackson has been transported superbly into a game world, where the sum total of his excellent animations, considerable array of funky moves and all the little touches that surround his legend (even Bubbles the monkey appears at the end of each level to direct you to the exit) is a unique and smartly judged tie-in. For beat ‘em up connoisseurs, it transforms an otherwise fairly by-the-by adventure into a pretty good one.